For Donkey Kong fans, here are some cool secrets and cheats to bring more fun when playing Donkey Kong Country Returns in Wii. Three Extra Lives : With low battery charge on your remote, play one of your game saves. You will get a message from Cranky that your battery is low and will give you 3 extra lives. Get Into Banana Temple : You have to beat the game to unlock Banana Temple. To get into the Banana Temple you must get the orb in each world’s temples and collect the KONG letters in every world. Infinite DK Coins : Use Diddy Kong’s jetpack in Sloppy Sands (Level 2-2) in area with two squid turrets below a bridge to make super bounce from the lower squid to the higher one shot out from the turrets. Then bounce again on the lower squid and repeat this action for infinite coins. Unlock Mirror Mode : You can unlock it after beating level in Banana Temple. In Mirror Mode you can’t play Diddy, the level is reversed, you can’t use items, and you only get one life. Unlock Music Galleries : You must defeat Boss by yourself. You won’t unlock the music if you use Super Kong in fight. Cliff Music Gallery, beat the Boss off the Cliff section. Jungle Music Gallery, beat the Boss of the Jungle section. Volcano Music Gallery, beat the Boss of Volcano section. Forest Music Gallery, beat the Boss of Forest section. Beach Music Gallery, beat the Boss of the Beach section. Ruins Music Gallery, beat the Boss of the Ruins section. Cave Music Gallery, beat the Boss of the Cave section. Factory Music Gallery, beat the Boss of Factory section. I hope those codes work. 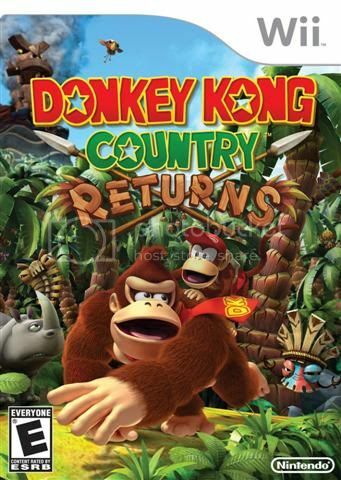 Happy playing Donkey Kong Country Returns then. This entry was posted in Cheats, Nintendo and tagged cheats for donkey kong country, donkey kong country cheats, donkey kong country returns, donkey kong secrets. Bookmark the permalink.